Australian made buffalo leather work belt, 30mm wide, with solid nickel plated buckle. Sizes :..
50mm leather work belt made from 5.5mm thick buffalo leather. Comes with solid nickel plated metal r..
Made from 3.5mm thick buffalo leather with 10mm felt backing, solid metal belt loops, this back brac..
Padded support brace and belt made from 3.5mm buffalo leather, 10mm felt backing, solid metal belt l.. 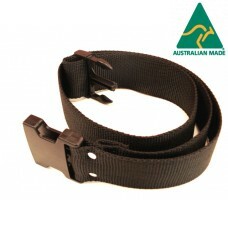 Heavy duty 50mm adjustable webbing belt with with quick, side release 50mm buckle. One size fits all..